I was driving into Point Roberts this past Sunday when I decided to turn left on Benson Road. I was driving down this main arterial and through a favorite treed area when I found several large gapping holes in what was once a tall powerful stand of wooded forest. Next to this main road stood bulldozers and log stacking apparatus, gas cans and plastic chairs for work crew members. In the background were smoldering brush piles that had consumed branches from trees and dense foliage that at one time protected the soil integrity and sheltered various animals from harm's way. I felt drawn to a particular pile where a number of 40 foot timber family members had given their lives for the sake of progress and growth. 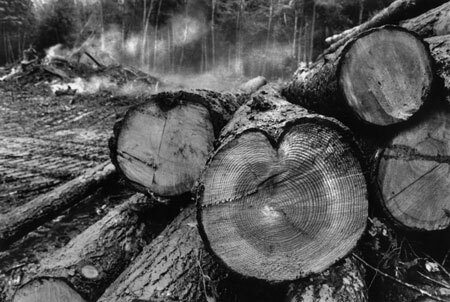 One heart shaped slain relative made me remember that these indeed were living icons of the earth and I could count the yearly growth rings to compare it's age to mine. As I pondered the concept of destiny I then wondered if this tree felt pain and a loss of purpose when the chain saw blade brought him down to earth. This valentine now will become lumber or firewood for us with no hope of ever joining the "Old Growth Club."